oooh..it may be a northern thing?? Is the saving adequate danger money? i don't entirely understand what you mean mr flibble. as far as i can see, regarding the simpsons/bang on the door eggs, they are eggsactly the same as the &#163;1.99 ones in sainsbury's. in my ideal world i wouldn't buy either..but there you go..i have. and faced with those choices i'd go for the one at 69p. i'm not altogether gormless, wouldn't buy a load of cheapo stuff just cos it's about to go rancid..i just gets what i needs. Sorry, i wasn't being eggspecially clear. What I was trying to eggspress is whether the eggstra saving gained is adequate compensation for going into a shop like Jack Fultons. Of course, it is in reality, but it was a joke. you're familiar with jack fulton's then? eggsemplary and eggstensive overuse of eggy words. phew! have a lie down before your head eggsplodes?? Bought the Green&Blacks Organic Maya Gold one today in Brighton. Was very tempted by the other ones that Infinity foods had, but reasoned that they were a little dear. My dad called me at work today to let me know he was at my house and leaving easter eggs for the girls on my table before he went away camping. When we got home we found four big Kinnerton luxury dark chocolate eggs with a big chocolate bar on! As I only have two children, my daughters have agreed that we will give two of the eggs as part of our donation when we visit Ferne animal sanctuary tomorrow. Why my dad thought that they needed this much chocolate I don't know!? Ooooh well, at least it'll last longer..! I asked my boyfriend when the Easter Bunny was coming but he wouldn't tell me. Well the Easter Bunny is coming to him tonight lol. A bit early - I know, but maybe that will hurry the bunny up with delivering my stuff! Maybe he thought that not as many people would make an effort to find vegan eggs for your daughters, since the staggering majority of eggs are milk chocolate. That's very self-sacrificing of your daughters to agree to donate them, especially when chocolate keeps so well. I'm resisting the temptation to buy 2 Divine dark eggs with chocolate covered brazil nuts, as the local fair trade shop is doing a buy one get one free promo. I may have to resort to it if the eggs I'm making don't turn out very well. I think I've started to go off chocolate, so I won't be buying any Easter eggs this year. I ate a small bar of chocolate earlier in the week and it was just too rich. I still love other sweet things though. Well the Easter Bunny is coming to him tonight lol. I think this post should be moved to the E zone!!! that's sweet of your kids to give the other Easter eggs away, cookey. how are your home-made eggs looking, twinkle? They're looking good, but as I said in the "what did you make today" thread, the texture of the ones using couverture and white as well as dark choc have gone a bit funny. They taste alright, but kind of brown sugary. hmm yeah, not sure why that would be, unless there's a weird ingredient in the Organica chocolate that prevents it from melting properly? the dark chocolate went ok didn't it? Again the Shite-ian excels itself. One of the eggs totally melted in the car on the way! But the other was donated. I made the girls an egg with that white choc mixed with plamil "milk" choc. And put Co-op jelly sweets in it. I know what you mean about the texture - but we forced it down! Harvest in Bath have a two-for-one offer: buy a Divine egg, get a Maya Gold free. It seemed rude not to. They're sitting in the bottom drawer in the kitchen now - if I listen, I can hear them calling to me "eat me... eat me... eeeeat meee". I bought an Elizabeth Shaw mint crisp easter egg today, the ingredients list doesn't mention honey, but it says on the front the egg contains 'honeycomb' crisp pieces. Does anyone know if it is real honeycomb as it doesn't mention honey in the ingredients or is it just sugar? Or is honeycomb always made from honey? I'm not sure, Sandra, but I know vegan store sells "honeynotcomb" so it is possible to make it without honey. Best to contact Elizabeth Shaw directly I guess. Thanks RedWellies, I have just emailed them to ask, but they probably won't get back to me until after Easter. I'll just have to leave it until I hear from them. It's going to drive me mad having to look at it and not touch! I went to ASDA today and these were the only one's left, probably because they were £5...whilst the evil cadbury etc ones are only a £1. No honeycomb of the sweetie variety I've seen for sale has ever had real honey in, the name comes from the airy texture. The Elizabeth Shaw crisp things used to be accidentally vegan, then they started saying that they contain traces of milk, but I imagine that's just because it's shared equipment, I'm pretty sure there's no honey in there though, especially if it's not listed in the ingredients. Hope so, Twinkle...........I thought it strange not mentioning honey in the ingredients. I think I'll wait to hear back from my email just to be sure. It's sheer torture having to look at it and not eat it, I think I'll put it away in a cupboard so I can't see it! A batch of jelly Easter eggs have been taken off the shelves at Waitrose supermarkets after a teenager nearly died after an allergic reaction to one. I got a dark chocolate raspberry Easter egg from Sainsbury's . that sounds amazing enchantress! was it dark choc with raspberry flavouring stuff in it? I saw one in sainsburys that i wanted, was a dark green and blacks one and came with a large bar of their cherry one and a large bar of their maya gold! Cost a tenner though. It was dark chocolate with little chunks of dried raspberry in it. 'Twas very nice. *Licks lips*. *sniff sniff* I didn't get an egg this year, although I've been dropping hints for like a month as I saw they had the maya gold ones in a local woolies, but my partner couldn't get one- they kept selling out!! but he did buy me a bar of chocolate and we tried making it into an egg by melting it down and covering his egg plastic in it, did not quite work- but it was fun and I still get chocolate!! 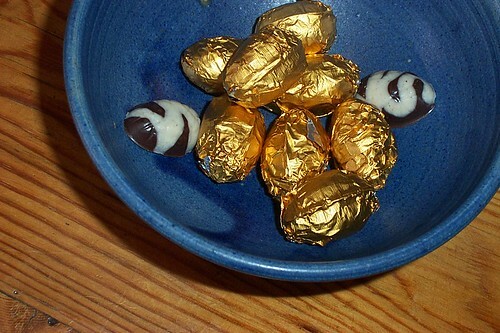 These were the mini eggs I made with Organica "white bar" and Divine dark chocolate. I ended up making a lot of different kinds - about 8 large hollow eggs, the white and dark mini eggs, Organica couverture and dark mini eggs, mini eggs where I made a shell of dark chocolate then filled them with vanilla truffle mix, and some with coarse hazelnut gianduja filling. I think the truffle filled ones were probably the most successful. Did buy one for my gran - id promised her an easter egg and her fave is dark choc - kinnerton are nut free so nice smooth choc as she is mainly on a soft diet but seems to manage small crumbs of choc still if not i know the staff at her nursing home will try to melt it and put it on top of ice cream or sponge pud for her! Wow, Twinkle! Wishing I was over there to help you test those out They look yummy!! "Born on the same planet, Covered by the same skies..."
OMG, Twinkle! I'm spending next Easter with you!!! If you're in the area in the near future I've still got a TON of chocolate left, Orange-powered! I'm in the area hehe. I have given up chocolate though in an attempt to loose this pesky stone i've gained! I might need to make a special trip over to yours then twinkle! actually you could probably save it all and make some more eggs at some point? I wanted to get those small moulds, so I could attmept to make vegan cream eggs, as I saw a recipe somewhere. I try to stay away from chocolate usually too, because even though I love it, I have no self control....but I think I earned some because I'm sure the whole country must have gorged this past weekend and I had none! there's a guy just started a new vegan chocolate business and is selling them through only a couple of local (Brighton) shops. he's doing eggs with truffles inside including peanut butter flavour, vanilla, orange and mint. the eggs themselves are plain, ginger or blueberry. I bought a 'basket' with peanut butter truffles (£10) but must report that the truffles were a huge disappointment. Not sweet enough or peanuty enough or soft centred enough. I had tried two other truffle flavours (rosemary and mint) which were for sale individually in May's General Store in Lewes which were lovely so had high hopes for these.